Introduction & purpose: There are many chemical suppliers with chemical search systems that would benefit by adding additional information like MSDS, or by a search over “all” synonyms. Some systems even lack the possibility to search by structure or substructure. Method: iScienceSearch is a meta search engine that searches simultaneously ca. 100 databases in the background. 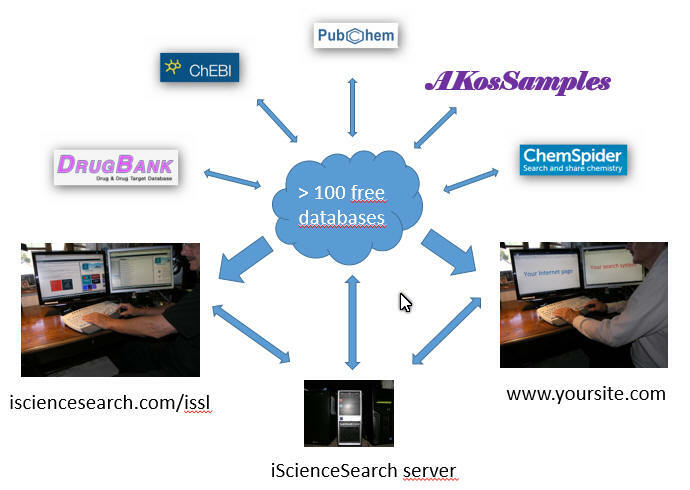 iScienceSearch can easily be integrated in any website. This means anyone having a chemical search application, like a supplier, can use a query or a result from his web site and transfer it seamlessly to iScienceSearch. Simply add an URL in format http://isciencesearch.com/iss/start.html?q=your-text-query or http://isciencesearch.com/iss/start.html?i=your-inchikey to your website. Results: If you search in a supplier’s web page you can access data seamlessly from the Internet, or find hits via synonyms, without having synonyms managed in the supplier’s application. Conclusion: A supplier can enhance his web page considerably with very little effort.